The fog is dense. It is one of the last mornings of the summer, and I really don’t know what I’m doing here. I’m the salmon fisherman, and salmon are in Byskeälven, Åbyälven or possibly in Kåge River. Not here, in Stora Bygdeträsket. 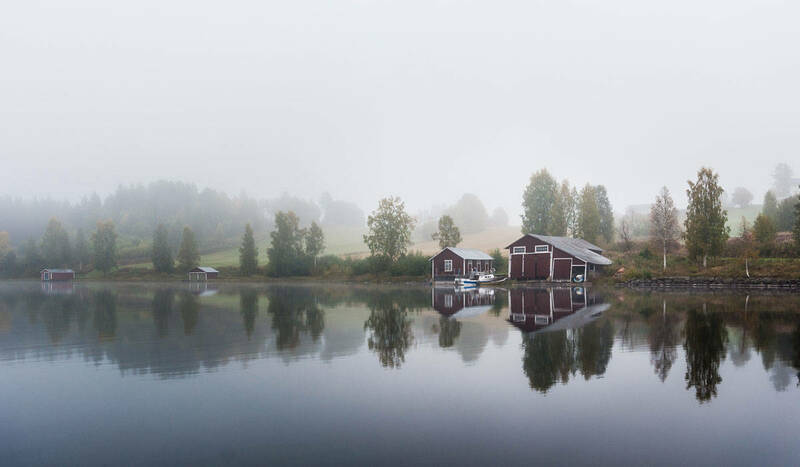 Early morning, foggy and perfect for pike fishing. – I think we’ll start in the bay over there, says Magnus and turns on the gas so the boat porpoises. 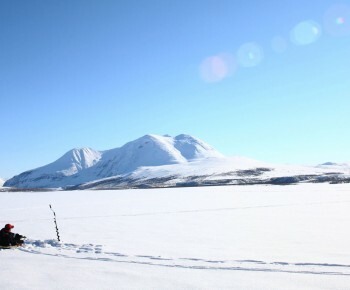 Magnus Lindgren, or Mangeboy as he is called, is a pike fisherman. Yes, actually one of Sweden’s foremost. A few years ago, he fished the pants off all southerners in a national pike fishing contest by catching five pikes of a total length of 597 centimetres. All were captured in Skellefteå waters. And today he has promised to teach me to fish pike. 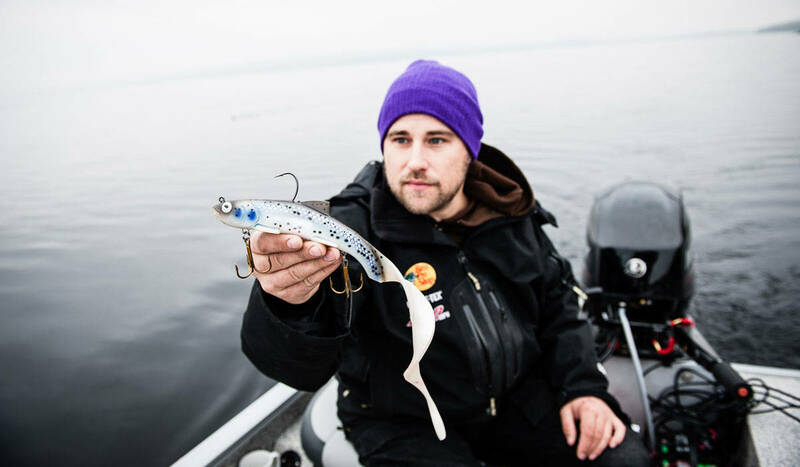 Magnus 'Mangeboy' Lindgren makes his own lures. 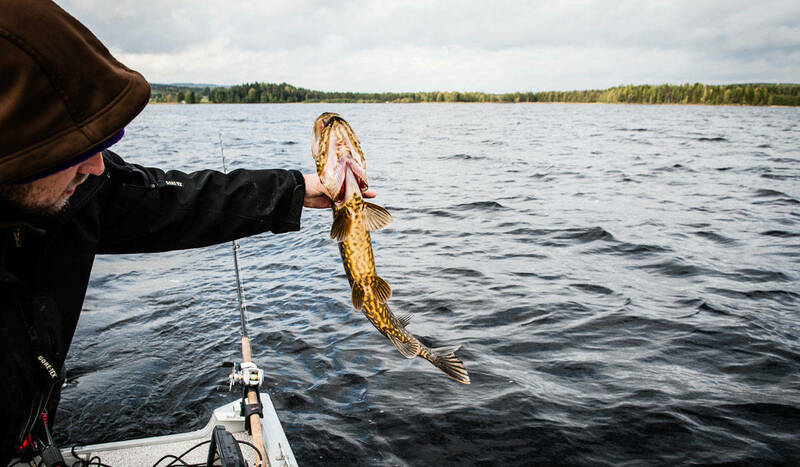 Magnus says that virtually all waters around Skellefteå can produce pike over 100 centimetres. The challenge is to find the water where the longest pikes are predominant. 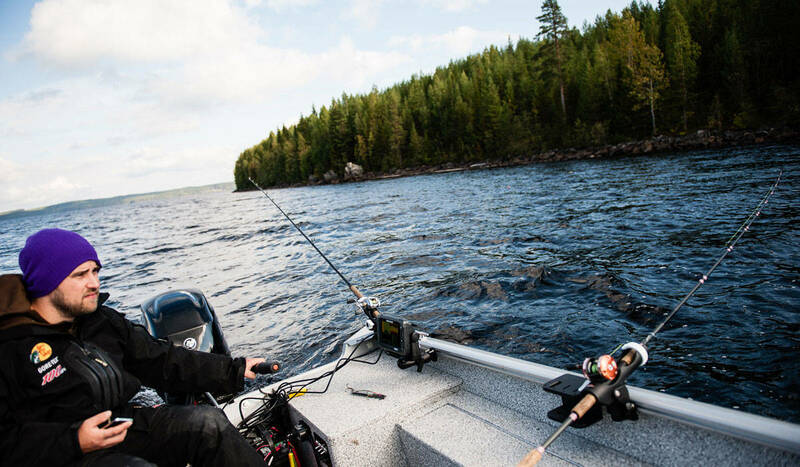 – The biggest challenge with salmon fishing, I say, is to learn to close your eyes. A fact. 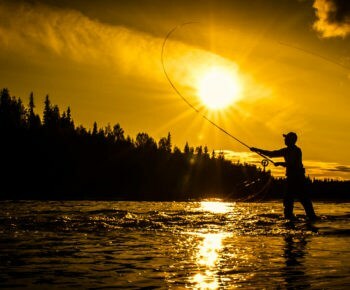 You need at least a thousand casts for each captured salmon in northern Sweden – statistically speaking. – You cannot rely on statistics, says Magnus and laughs. We rig our rods. Five of them. One needs to adapt the methods to the circumstances. And today our way of fishing Västerbotten’s largest lake is trolling. – Large pike can be all around, he says. One success factor is to be able to cover as much water as possible. Stora Bygdeträsket is in Skellefteå county. Magnus takes pike fishing seriously. He fishes purposefully and thinks strategically. Yes, he even makes his own lures, and they’ve caught so many large pikes that they now can be purchased in fishing stores around the country. – You know, I say while Magnus rummages around in one of the full bait boxes, I’ve got a salmon at 112 centimetres. – My biggest pike measured 122 centimetres, he counters. It looked like a waterlogged tree trunk when it came up. Centimetres are essential for a sports angler. In earlier years, it was just the weight that mattered. Kilograms and grams. Now we measure our catches. It has to be catch and release, a concept which means that you release the fish back after you caught it. 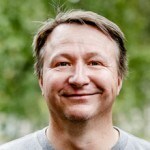 – Big fish do more good in the water, says Magnus. 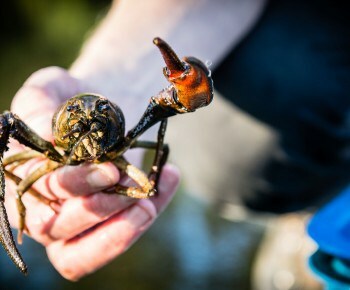 Catch and release are essential if we want to have good fishing in the future. The biggest pike ever measured, was 150 cm. A little timid I reveal my biggest pike is a summer fish at 2.5 kilos. – Then you will pass that today, says Magnus. Here is plenty of baitfish. He points to the sonar. 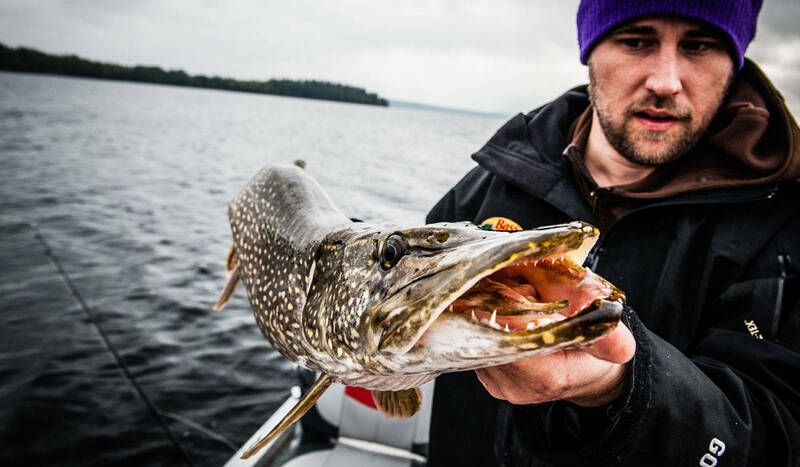 It will not be long before there is a pike in one of Magnus lures. – Indeed a decent fish, he says, and hands me the rod. The drill is undramatic. Magnus grips the pike by the gills. The scale shows a scares six kilograms. As a salmon fishermen, it is hard to accept how easy pike fishing seems to be. 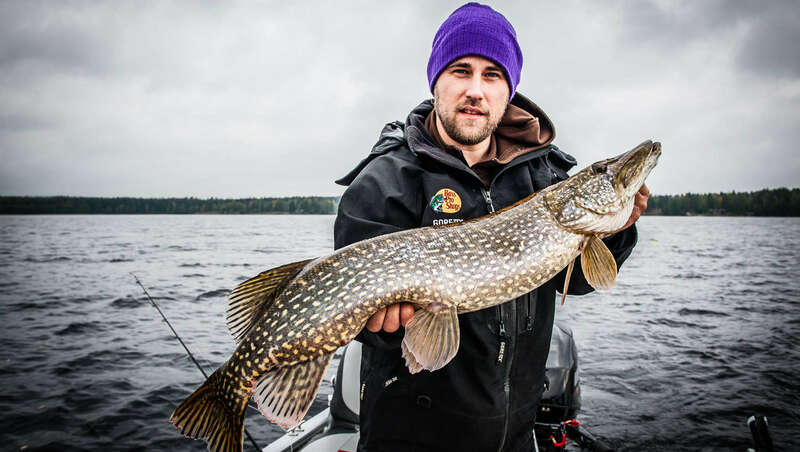 – Smaller pike is not a major problem, says Magnus. The really big ones, however, require that you know what you are doing. – Small pike? I say offended. I’ve only just more than doubled my personal best. Easy days for a pike fisherman. – No, says Magnus. Not here. – Plus ten, I say. – It happens. There are big fish. – Nah, we have enough for one day. Because sometimes you just have to break and come back – even if it is one of Sweden’s most successful large pike fishermen.